A place to connect and grow. Swim Houston Aquatic Center (ShAC) is Houston's premier swimming facility. ShAC hosts swim classes, team swim events and training, water aerobics classes and private parties for children and adults. The organization is family owned and operated. Swimming and swim instruction has been a Gilbert and Karol Legaspi family passion for generations, and along with its staff are impassioned about bringing their knowledge of skill and safety to the greater public. Containing a nine-lane heated outdoor competition pool, three of which are 50 meter lanes, and an indoor teaching and aquatic therapy pool, the ShAC campus is a state of the art facility ready to suite a complete host of functions and services. Most of all, the ShAC team is guided by the philosophy of community and all of its members being part of the family. For any inquiries into the ShAC organization, please use the CONTACT PAGE. ShAC is a true family owned and operated business. When customers come in the doors they become a part of the ShAC family, with all the care and community that comes with it. Coach Gilbert has been coaching under USA Swimming for almost 30 years. Graduating from the University of the Philippines Integrated School and earning a degree in Accounting and Business Administration from Houston Baptist University, Coach Gilbert has shown great commitment to the sport of swimming. He is involved with the governance of the sport at both the national and regional levels, through USA Swimming and Gulf Swimming. Coach Gilbert has lead his swimmers to many elite championship meets, including Junior Nationals, Nationals and every Olympic Trials since 2000. Many of Coach Gilbert’s alumni swimmers have gone on to swim in colleges with the most competitive records. In 2015, Coach Gilbert was awarded Gulf Swimming’s Head Coach of the Year Award. Coach Gilbert coaches the Senior Group and Junior Group currently given at the ShAC. Most of all Gilbert enjoys seeing every individual swimmer flourish under his instruction. Head Age Group Coach and Owner Karol Legaspi has been an Age Group Coach for almost 30 years. She graduated from Houston Baptist University with a BS in Early Childhood Development and Elementary Education. 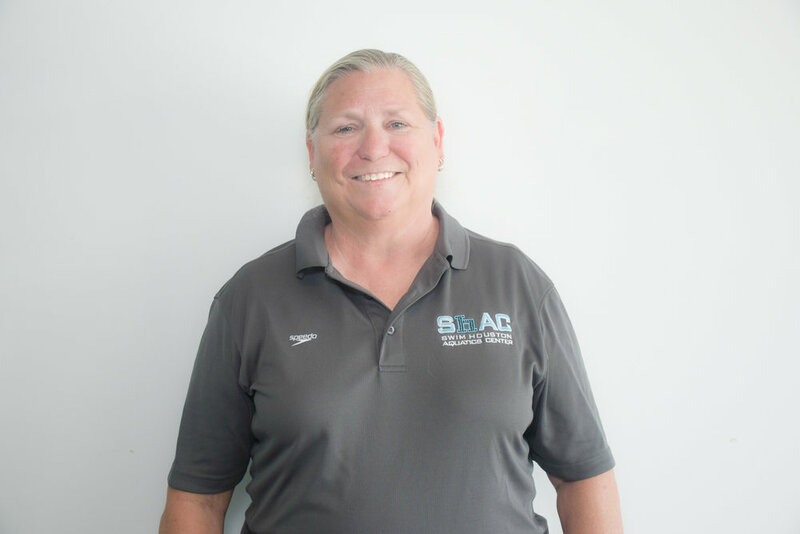 She has been a certified USA Swimming Swim Coach since 1998 and is a lifetime member of the American Swimming Coaches Association. Because of her expertise in advanced swim technique, Coach Karol is sought after by many swimmers for her private coaching sessions. Coach Karol’s vast experience and commitment to the sport are evidenced in the quality of the swimmers she has produced. Every season Coach Karol has state qualifiers, many of whom have gone on to become finalists and/or winners at the Texas Age Group Swimming Championship. Coach Karol coaches Shac 2, 3 and Junior 1 groups. Individual personal achievement is at the forefront of Karol's philosophy for swim instruction, and it drives her pride in being a business owner. Tony swam competitively for 7 years and has taught swimming for over 15 years in the Houston area. Coach Karol's son, Tony has expertise in fine tuning stroke techniques and working with upper level swimmers. He is certified in Infant/Toddler and Special Abilities from US Swim School Association. In addition, he has an upbeat, can-do attitude that will help anyone achieve their personal swimming goals, be it learning the basics or refining experienced swimmers. To improve your swim, talk to Tony. Karen swam competitively for 7 years. She has taught swimming for over 15 years in the Houston area. She is certified in Infant/Toddler and Special Abilities from the US Swim School Association. Coach Karol's daughter. Karen's started teaching swim lessons when she was 19 years old and has a found a passion in teaching babies and toddlers life saving skills.